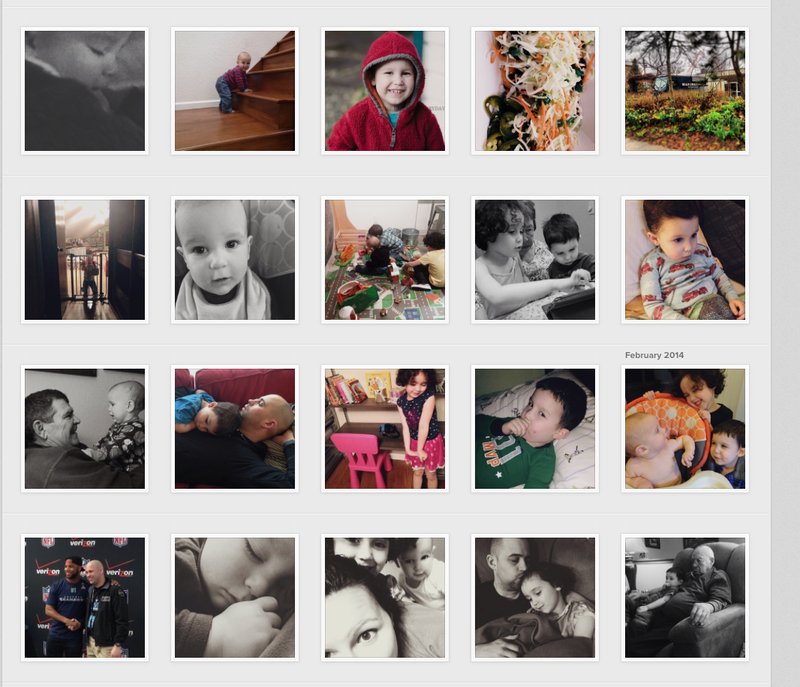 A sneak peek at my first 100 days of Project 365, as captured on Instagram. In previous years, I have attempted one Project 365 (which lasted about four days before I went down in a ball of flames) and one Project 52 (a picture a week). Both times were failures, and yet this time I’m succeeding! What changed? I forced myself to be more accountable this time by joining Instagram and posting daily. Knowing that I have told other people that am participating in Project 365 and that I will have people to answer to if I don’t post has really helped me along. There have even been a few 10 p.m. text messages asking, “Where’s your pic for today?” that saved me from forgetting a day! 2. An iPhone picture can be a worthy way to capture your life. Very few of my Project 365 photos have been taken with my DSLR. At this stage in my life, I don’t take out my DSLR often, for a variety of reasons (I don’t want my kids getting “camera fatigue,” I don’t want to have to worry about it with three kids getting into everything; the phone is nearly always with me). And even with just my phone, I have captured some precious memories. 3. Choosing a theme or particular challenge can provide inspiration. There are a variety of photo “challenges” out there that offer prompts for your Project 365. Some people find these really help. @ClickinMoms on Instagram has a weekly post listing your prompts for the week. I haven’t done the prompts, but I have decided to challenge myself with certain areas of my photography (i.e. a meaningful “headless” photo, or use negative space creatively) to make my Project 365 more than just a series of snapshots. 4. Embrace the imperfections and even the “boring” days. Not every day is going to be one that you deem photo-worthy, but that’s sort of the point. Project 365 isn’t a highlight reel; it’s a documentary of a year in your life, boring moments and all. Accept that not every photo is going to be a prize-winner, and not every day will be full of exciting moments. Embrace your reality. 5. Project 365 is really a project of gratitude and celebration. Most importantly, recognize that Project 365 is really about celebrating the little things (and little ones perhaps!) in your life and honoring them, and about reminding even yourself that there are details and moments worth noticing everyday. Project 365 is awesome because it is helping to train me to look at the world with more gratitude, respect, and love. Are you following my Project 365? Tomorrow I’ll post 10 of my favorite photos, but if you want a sneak peek, go follow me @theblessedeveryday on Instagram, where I share my daily photos, and search #365blessedeveryday. This is great! Serious respect coming your way for keeping up with the 365 project 😉 And you’ve captured some really great moments in your first 100 days.